The Chemical Biology program offered by the College of Life and Environmental Science (CLES) of WZU is dedicated to training international frontier researchers and skilled technicians, who are keen on international scientific and technological communication and cooperation. All courses are delivered in English using original English textbooks, lecture notes, and/or lab manuals. 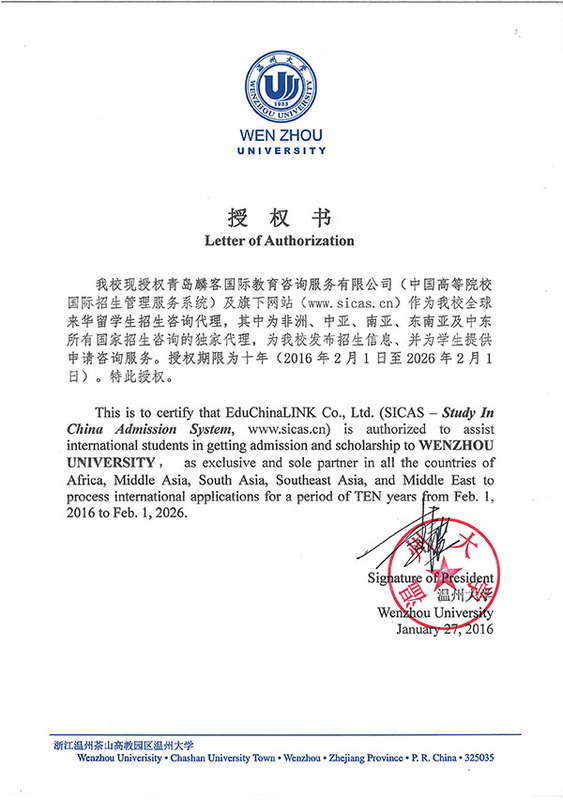 Financial Support: Our program welcomes international students who have acquired scholarships of exchange programs between the governments, or from the Chinese Scholarship Council (CSC), or from Zhejiang Province to study at WZU. For students having not acquired the above-mentioned scholarships, they will be offered full scholarship by WZU in their 1st year of graduate studies. From the second year on, the students will be offered full or partial scholarship depending on their studying and research performance in first year. At the meantime, advisors will also provide research assistants allowance after students start their graduate research projects. CLES will also give the Dean's Honors Award to students who have done excellent research works during their graduate studies. In all, every international graduate student will be offered scholarship that is sufficient to cover his/her tuition fee. Job opportunity: Graduates from this program can continue their education toward Ph.D. degree or find jobs in Biotechnology Industry, Food and Drug Administration or the Customs Import and Export Inspection and Quarantine Department, etc in their home country, or the related industry and department in China. Courses: The core courses include Chemical Biology Introductory, Bio-pharmacy Introductory, Biochemistry, Biochemistry Laboratory Technique, Molecular Biology, Molecular Biology Laboratory Technique, Cell Biology, Cell Biology Laboratory Technique, Chromatographic Analysis Technique, Biostatistics, Reading and Writing in English literature, Lectures on Frontier of Life Sciences, etc.